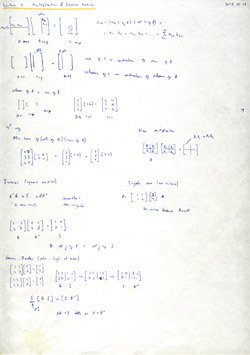 This is the third post in an article series about MIT's Linear Algebra course. In this post I will review lecture three on five ways to multiply matrices, inverse matrices and an algorithm for finding inverse matrices called Gauss-Jordan elimination. 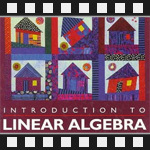 The first lecture covered the geometry of linear equations and the second lecture covered the matrix elimination. Lecture three starts with five ways to multiply matrices. The first way is the classical way. Suppose we are given a matrix A of size mxn with elements aij and a matrix B of size nxp with elements bjk, and we want to find the product A·B. Multiplying matrices A and B will produce matrix C of size mxp with elements . The fourth way is to look at the product of A·B as a sum of (columns of A) times (rows of B). The fifth way is to chop matrices in blocks and multiply blocks by any of the previous methods. Here is an example. Matrix A gets subdivided in four submatrices A1 A2 A3 A4, matrix B gets divided in four submatrices B1 B2 B3 B4 and the blocks get treated like simple matrix elements. Element C1, for example, is obtained by multiplying A1·B1 + A2·B3. Next the lecture proceeds to finding the inverse matrices. An inverse of a matrix A is another matrix, such that A-1·A = I, where I is the identity matrix. In fact if A-1 is the inverse matrix of a square matrix A, then it's both the left-inverse and the right inverse, i.e., A-1·A = A·A-1 = I. If a matrix A has an inverse then it is said to be invertible or non-singular. Matrix A is singular if we can find a non-zero vector x such that A·x = 0. The proof is easy. Suppose A is not singular, i.e., there exists matrix A-1. Then A-1·A·x = 0·A-1, which leads to a false statement that x = 0. Therefore A must be singular. Another way of saying that matrix A is singular is to say that columns of matrix A are linearly dependent (one ore more columns can be expressed as a linear combination of others). Finally, the lecture shows a deterministic method for finding the inverse matrix. This method is called the Gauss-Jordan elimination. In short, Gauss-Jordan elimination transforms augmented matrix (A|I) into (I|A-1) by using only row eliminations. [00:51] The first way to multiply matrices. [04:50] When are we allowed to multiply matrices? [06:45] The second way to multiply matrices. [10:10] The third way to multiply matrices. [12:30] What is the result of multiplying a column of A and a row of B? [15:30] The fourth way to multiply matrices. [18:35] The fifth way to multiply matrices by blocks. [21:30] Inverses for square matrices. [24:55] Singular matrices (no inverse matrix exists). [30:00] Why singular matrices can't have inverse? [41:20] Gauss-Jordan idea A·I -> I·A-1. 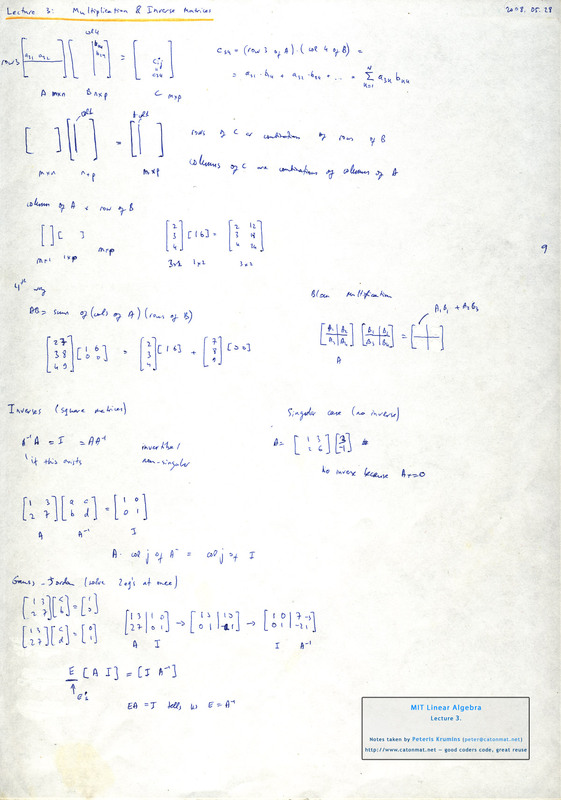 My notes of linear algebra lecture 3 on the matrix multiplication and inverses. The next post is going to be about the A=LU matrix decomposition (also known as factorization).